American husband and wife writing team who collaborated (both writing and illustrating) on a number of children's books. Mary was born in 1890 in Cincinnati. She had an early interest in art and poetry and later studied art. She married Conrad Buff in 1922 and worked as a teacher and museum curator before beginning her writing career. Conrad Buff was born in Switzerland and grew up on a farm. He emigrated to America in 1904 where he worked in various jobs and pursued his hobby of painting, until becoming recognised as a talented artist. He settled in the West, after falling in love with its landscape. 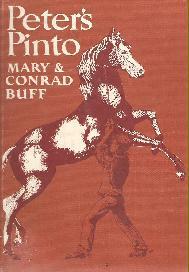 Mary and Conrad published a total of 14 books together, with Mary mainly writing the story and her husband illustrating. These stories reflect their backgrounds, featuring both the American West and Switzerland. The theme of nature is also recurrent in their works. Some of their books were nominated for the Newbery Medal. As far as I know just one of their books featured horses and is a typical boy's ranching story, although set against a Mormon backdrop. It has very nice illustrations but the story may not appeal to horse-lovers because of the old-fashioned, cruel way the wild horse is caught and broken. Mary died in 1970 and Conrad in 1975. Reprinted by Ward Ritchie in 1965. Available now from Kessinger as a print-on-demand paperback. SUMMARY: Ranching-style story set in the Mormon community of Utah. Peter goes to stay on his uncle's ranch in Utah. There he soon learns to ride and has lots of fun riding around the ranch with his cousin Doug. But he longs for a horse of his own and keeps having dreams about a beautiful pinto stallion called Checkers. Then the children hear rumours about a mysterious wild pinto roaming the hills. When one of the ranch horses goes missing and a hunt for it is organised, Peter and Doug seize the chance to look for the pinto. The book is in print at the moment as a print-on-demand title and is available in both the USA and UK. The older editions are reasonably easy to find in the USA and cheaper than the new paperbacks, although these older copies are not seen very often outside of America.